Whether you’re a zip line tour, challenge course, aerial park, resort, adventure park, family entertainment center, or experiential learning facility, you probably already have platforms or towers in place. The challenge is that many facilities treat these platforms as single-use structures with a limited purpose. Each structure is used for one specific activity, whether that’s climbing, jumping, zipping, or as a transition from one activity to another. While these platforms no doubt serve an important purpose in your operation, they don’t actively work to increase revenue, maximize throughput, or satisfy your customers. Building platforms for individual activities is time-consuming, expensive, and hurts the overall ROI of your facility. Quickly turn existing platforms and towers into yet another revenue opportunity with minimal investment and a quick return on your investment. The key to generating more revenue from your existing platform is to think creatively about ways to utilize it to its full capacity. Your existing structures can support a wide variety of activities which can contribute to an improved customer experience, increased throughput capacity, and maximized revenue potential. Rather than utlizing one structure for each activity, consider ways to bundle multiple activities together onto your existing towers, creating a multi-use space that takes advantage of the potential for big gains with a minimal investment. From belay-assisted rappelling to free fall thrills and leaps of faith, you can maximize your existing structures to increase profits, satisfy customers, and set your facility apart from the competition. This white paper will discuss specific strategies for increasing revenue by adding additional adventure and amusement activities to your existing structures, with thrills geared to everyone from the first-time risk-taker to the seasoned adrenaline junkie. How can new activities on my tower increase my ROI? Your existing tower is a revenue stream waiting to be tapped. With opportunities to increase throughput, maximize your revenue, and create happy return customers, it is easy to see why adding activities to your existing towers is beneficial to your bottom line. When you install activities on your tower, you create the opportunity to accommodate more people at your business than ever before. Instead of turning people away on busy days, or making them wait for hours for their turn, you can use your tower as a space to entertain people while they are waiting to participate in your main operations (or perhaps even offer it to them as a separate option instead of what you typically offer in your main operations). When you can accommodate more people at a time, you can create more revenue per day from ticket sales for activities as well as from sales of ancillary items such as sunscreen and photography. Renting your newly-equipped tower out to interested groups for a premium price, while still being able to run your normal operations and continue bringing in revenue. Groups to target could include corporate team building, bird watchers, churches, schools, and local scout groups. Consider creating special events to cater to these same groups, such as an early-morning weekend tour for bird watchers where participants could take time on each platform to pull out their binoculars and make notations in field notebooks before free falling, rappelling, or zipping their way back down. Finally, by adding these optional attractions you will create a memorable experience that will encourage your customers to come back again and bring their friends. Adding activities increases the opportunities for your customers to experience additional thrills and excitement and compels them to return. It is generally more cost-effective to create repeat business than to find new customers, so the more you can encourage people to come back, the less you need to spend on marketing to keep your business booming. Want to learn more about how to add activities to your existing structuress in order to increase your revenue? Then read on to learn what kinds of activities you can incorporate on your existing platforms with minimal cost, time, and labor. What kind of activities can be added to my tower? Many people are not interested in jumping out of a perfectly good airplane or the dangerous recoil of bungee jumping, but still want the thrill of experiencing free fall. There are several descender options available to satisfy both nervous jumpers and your bravest thrill-seekers. The typical descender device operates simply by attaching the device’s carabiner(s) to the participant’s harness and allowing him or her to jump or step off of your platform. Having various free fall options available on your structure will allow your participants to choose the experience that’s best for them. Consider creating a setup where participants can start with more introductory, less intimidating jumps, then return to the platform to increasingly thrilling options. Once people experience a jump, they are usually interested in doing it again. Having free fall activities set up in both low and high locations, and with varying amounts of free fall distance, is a great way to get participants to keep trying new jumps. A jump option can also be employed to get downfrom a platform or to get to the next activity at your facility. For zip lines, this could mean arriving at a landing platform, and then jumping down to the next launch platform. Regardless of what type of facility you have, there is usually an opportunity for at least one jumping element on your existing tower. Introductory-level free fall rides using a gentle descender device or auto belay can be used as a stepping stone to help your customers build the courage to try descenders from higher heights with longer free fall distances. These initial intro-level free falls are usually installed under 40 feet, and don’t ever hit true free-falling speed, but rather provide a controlled acceleration throughout the descent. With any free fall activity, the hardest part is stepping off the edge, so even your intro-level free fall will still provide big thrills to customers. A platform rigged with a descender device with intermediate or advanced free fall heights provides a true, exciting vertical free fall experience for your visitors. An intermediate free fall is typically installed between 40 and 65 feet, while an advanced free fall can be installed anywhere from 70 to 100 feet. When your customers step off the platform, they will feel an initial free fall sensation as they accelerate with the speed of gravity. Just when they start to wonder if they’ll ever slow down, the brake engages gently to lower them comfortably to the ground, wanting to jump again. The Leap-of-Faith is a unique confidence-building activity where participants clip into an auto belay device and take a running leap off of your platform. The auto belay is attached to a trolley on a line that projects from your tower to a point in the distance. As the auto belay traverses the line, your customers descend diagonally. The Leap-of-Faith is fun enough on its own to generate repeat customers, but to improve the odds of a visitor buying multiple descents on your Leap-of-Faith element you can hold contests to see who can leap the farthest, or set up targets to see who can land the closest to them. Leap-of-Faith is similar to a free fall combined with a zip line and works exceptionally well as an experiential learning or skills-building element. Rock climbing is a physically and mentally challenging activity that can easily be added to your existing tower. Climbing can be a challenging and fun way to get participants up to the top of a high structure, and is particularly useful if you’d like to create a way for your customers to easily return to the top of your tower to repeat activities such as zip lining or free falling. There are many ways to incorporate a climbing element into your facility, including building a climbing wall on the side of your tower or using a modular climbing kit on existing structural supports or nearby trees. Climbing is an activity suitable for people of all ages, and routes can be set to accommodate anyone from the first-timer to the experienced pro, making this activity appropriate for any of your customers, no matter who they are. For a climbing option less costly and labor-intensive than a climbing wall, consider a climbing kit that you can install on the leg of your tower and nearby trees. Most kits come with ratchet straps, plates that slide onto the straps, and handholds that fasten to the plates. To install your kit, assemble the handholds, plates, and ratchet straps, then secure your straps around the leg of your structure or the trunk of a tree to create a simple, cost- effective way for participants to get back up to your platform. Handhold sets are available in varying difficulty to satisfy all customers of any climbing ability level. Unlike the climbing wall, however, you can only have one customer climb at a time using a climbing kit, so consider installing several kits on all available posts and on nearby trees to allow maximum participation in your climbing activities. Using an auto belay device to minimize risk and cut down on staffing needs is also recommended. To further add excitement to this unique climbing element, you can also incorporate a modular platform that easily affixes to any tree or pole, allowing people to climb up to the ledge, jump off using a descender device, then climb back up to do it again. An easy and aesthetically pleasing way to incorporate a climbing element into your existing structure is to build a modular climbing wall. There are many pre-fabricated artificial walls available on the market, and different size and shape handholds are available to accommodate climbers of all abilities. Climbing walls can also usually be constructed from wooden planks or plywood; please consult your engineer to determine the best way to go about attaching a wall to the side of your structure. One of the most advantageous benefits of a climbing wall is that it allows several participants to climb back up to a platform at a time, increasing your throughput. We suggest equipping each climbing lane with an auto belay device to cut down on staffing needs and to mitigate the risk of human error in belaying. Once at the top of your wall, your customers will be able to choose which activity they would like to participate in next, and if you provide a variety of options at the top, you may be able to sell multiple climbs to individuals as they take another ascent in order to experience a new activity. You can maximize revenue from your climbing wall by charging additional fees per ascent. Your climbing wall can also accommodate high-throughput rappel stations, allowing participants to use ropes to descend down the wall like a pro with the security of being attached to an auto belay as back-up security. If participants drop their brake hand, the auto belay slowly lowers them down, acting as a safety device while they learn to rappel and limiting the need for staff supervision. Again, maximize revenue by charging per descent. Zip lines are gaining in popularity around the world, especially as part of eco-tourism and adventure travel, where a zip line can allow people to experience a rainforest canopy or majestic view from a new perspective. Nowadays zip lines are becoming higher, faster, and longer, catering to adventurers looking for more thrills. Zip lines are traditionally a platform-to-platform set up, but can also be installed as a steep angle zip from a platform to the ground. Your existing tower could make a great launch or landing platform to add a new zip line. In a standard platform-to-platform zip line, most operators have platforms dedicated to launch and landing. If your existing platform is near another structure, you may be able to utilize it as either a launch or landing in order to create a standard zip line. You could also consider zipping from the platform to an elevated point in the distance, such as a hilltop. This wouldn’t require building a new platform, but would still allow you to set up a standard zip line with minimal investment of time or money. A steep-angle zip line launches from a platform or elevated structure, just like a standard zip line, but the steep-angle descends at approximately a 30 degree angle down to the ground. The steep-angle installation is a great option if you don’t have another platform or elevated point to use as a landing area, or if you want a really unique offering that is not commonly seen. The steep-angle descent is a great, unique way to get participants from a high place down to the ground. This installation also works well as an exciting alternative to stairs or ladders for getting your customers off of your tower. Build a small aerial park or challenge course off of a platform where customers can follow a path through various obstacles before returning to the main platform to continue their zip tour. Consider adding the aerial park as an add-on charge or as part of the tour. 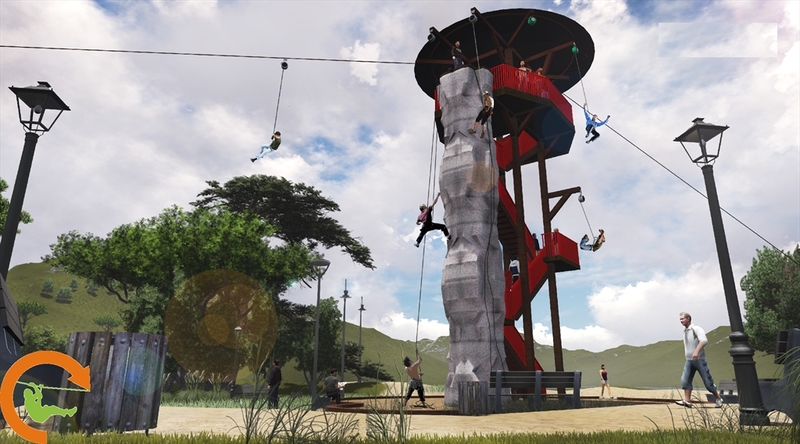 You could even incorporate jumping and climbing elements to add thrills to the course. Put a descender device on a platform and sell jumps as standalone add-ons, or build a separate pole including a climb and jump in the middle or end of a course or tour where customers could pay extra to include this feature in their experience. Add interesting elements between platforms or structures, such as rope bridges or swing elements. You could also include these types of elements as a route out-and- back from a main platform. If you have spectacular views from your platform, consider renting it out for romantic dinners or family photos. While this wouldn’t probably become a major revenue stream, it could be a unique way to get local press and set yourself apart. Add facilities to the bottom of your structure. Consider restrooms or a concession stand, especially mid-way through a long tour. Having snacks and beverages for sale could become a steady source of additional revenue. You could also incorporate one beverage and snack per person in the activity fee. These facilities also encourage your customers to spend more time at your tower and to enjoy more activities. If you have a tall structure, turn it into a viewing platform or observation deck. Allow customers to either climb up or take a ladder or staircase up to check out the views. If you don’t have a structure tall enough, make your existing structure taller if possible to allow you to offer this activity. Use layered platforms that allow you to incorporate jumping or rappelling and climbing. If you have a zip line tour and hike from one platform down to another, adding a jumping element would provide a more fun and exciting way to get to that next platform. Alternatively, if you have to climb up to the next platform, add a climbing wall or climbing kit and give customers the options of climbing or hiking up. Add photography elements to your facility. Have a photographer stationed on the most interesting platform and allow group photos of each group. You could also have a photographer follow the group through and take candid and staged photos throughout the tour. The photographer could automatically join every group or be available for an additional fee. Alternatively, consider having an automatic photo at a few particularly interesting locations throughout your tour. Customers could then buy the photos in the lobby after their activity ends. Another option for descending is building a slide. Allow participants to slide down, and then either climb or hike back up to the platform for the next activity. Regardless of how you choose to use your existing platform, structure, or tower, remember that there are many ways to maximize that space, drive revenue, and ensure happy, repeat customers. While every facility will do this differently based on their setup, nearly everyone could benefit from adding activities and adventure with easy-to-install, high-ROI devices, such as our TRUBLUE Auto Belay, Arboreal Climbing System, QUICKjump Free Fall Device, zipSTOP Zip Line Brake, or FlightLine Commercial Descent Device. Your imagination is your greatest resource in identifying ways to turn your existing structures into highly-performing multi-use spaces. If you want to take full advantage of your facility, but don’t have the time or energy to do it yourself, consider the new Adventure Tower. A highly customizable structure that can support multiple adventure activities in a vertical space, the Adventure Tower could be just the thing to increase your bottom line and position your facility as the best in your region.